It’s time to vote for what you think this week’s coolest gadget is, leave a comment for a chance to win a $50 Amazon voucher. The Econav is like any other Sat Nav with GPS, speed indicators and traffic alerts. It’s difference is in its ability to help you drive in the most environmentally-friendly way.It analyses your various route options and providing you with an eco readout of the potential cost to yourself and the environment. The Econav has a database of over 6,000 cars, so it can tell you the precise moment you should switch from second to third gear on a 2008 Ford Mondeo to keep emissions and petrol costs down. 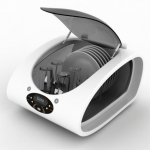 This tiny dishwasher is small enough to fit on your worktop. It prides itself on being green and saving on energy and water and is ideal for people living on their own or for couples. Whoever uses it, it certainly beats washing up. With summer just around the corner you will be thinking about holidays and sun. Well if you’re looking for a great pair of gadget sunglasses then look no further than the TriSpecs. TriSpecs are stylish, unique and innovative. Not only do these give you a great look but they also possess wireless technology which you can listen to music and answer your mobile phone from whilst wearing them. iPhones and iPods are great, but if you use them a lot while out and about you’re going to run out of battery – but with this backup battery charger you can give your iPhone or iPod that much needed injection of extra power to keep you going until you get home! The full post can be found on Zath Hi-Tech Gadgets. If you ever imagined what it must be like to swim like a fish, you may just get your chance. Engineer Ted Ciamillo has come up with a carbon fiber and fiberglass monofin, allowing a swimmer power through the water at 8 mph, twice the speed of Michael Phelps. Avaak Vue Personal Video Network is surely one of the most state of the art systems going. Mount their 3″ high cams anywhere in your house and they will deliver battery powered, wireless images to the base station without a PC. You get access to them on a password-protected site even if you are not home. Not only can you move the cameras around, you can take video or stills and upload them to social networking sites. The full post can be found on Networking Audio Video. In a recent survey, a significant number of people felt that laptops were highly fragile, prone to data loss. 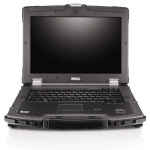 With that in mind, Dell designed the Latitude E6400 XFR. This laptop comes with ballistic armor and meets 13 military specifications including drop tests, thermal shock, temperature extremes and explosive environments. The laptop can withstand the harshest of treatment without being damaged. One minute of winding, and you’ve got yourself enough power for a full shave! It also comes with three individual heads that properly flex and rotate to provide a close and precise performance. This has to be one of the coolest PC case mods we have seen so far here at geeky gadgets, the Great Pyramid PC Mod, made by modder polo360x from the Techpowerup forums. This amazing case was made from a customized Luxor Pyramid case, which was made from laser cut aluminum, and is a combination of black and silver aluminum, the base measures 19 by 19 inches and the case stands 25 inches tall (there were only ever 200 of these cases ever made, and it looks like there is one less). The full post can be found on Geeky Gadgets. the pyramid PC!! that thing rocks! I run mine out with barely enough time to get in on the charger at home. the fin looks great, one step closer to being the mermaid i’ve always dreamed of! After just doing the dishes, I’m voting for the tiny dishwasher. I have to vote for the Pyramid PC – it looks so cool! Plus I love anything that is transparent with pretty lights in it. The shaver would be great for my car…for those days you forget you have a meeting and need a quick shave on the way to work! The tiny dishwasher! I hate doing dishes and it takes forever to fill up a regular sized dishwasher. This week I vote for practicality. The dishwasher gets it. The wife and I just don’t use enough dishes to need a full-sized washer. 2nd place goes to the new Dell “I want to be a Panasonic Toughbook” notebook. I’m all for things that I can accidentally drop and not have to worry too much about. Ohh, and the Monofin? If I was ever driving a boat and saw that guy in a lake….I would swerve….to hit him. Dishwasher. Well, this or paper plates. The Great Pyramid PC is amazing. Tiny dishwasher! Perfect for my desk — I’m tired of scrubbing my tea cup in the bathroom sink. My vote goes to the Great Pyramid PC takes the boring box to a new level , a true work of art. Definitely need to get the tiny dishwasher. Would make cleaning my dishes at work a breeze. 8mph in water can’t be beat. Dolphin fin rocks but, is it really wise to look like a fishing lure? Screw it, no risk, no fun. The Vue would definitely help with my home security. I really like the dishwasher. I hate washing up but don’t have space for a full size or thin dishwasher so this would be perfect. The dishwasher rocks. No more trips to the office sink! A shock proof laptop, with enough capabilities to do my daily job always will be the most useful gadget. i mean the thing can be dropped from a building! Both the D-fin and the dishwasher are nice. The Dell looks useful as well.